FM Leif Pressman started off the night with two straight wins. 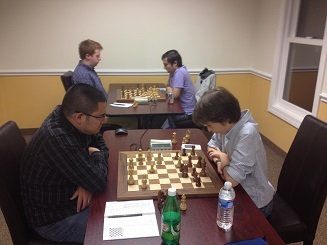 However, a last round loss to NM Daniel Lowinger created a three way tie for first in the top quad. Things were much clearer in the second section (a six player swiss). 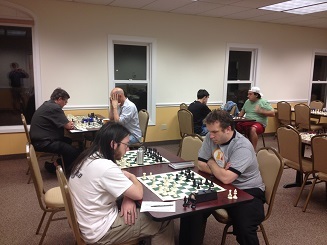 CCFC instructor Daniel Cooper won all three games to take sole first place. Ryan Young and Garrett Browning tied for second place with two points each.